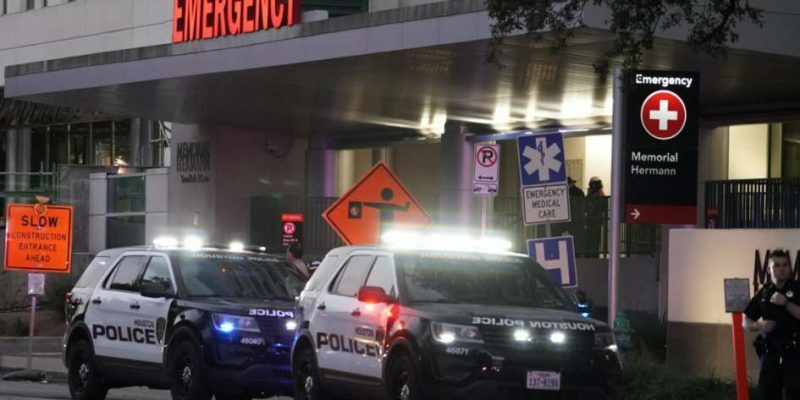 Four Houston Police Officers are in the hospital after a shootout at a suspected drug house that ended in the deaths of both suspects. Two of the officers were reportedly shot in the neck and rushed to surgery in critical condition. The other three are reported to be in stable condition. Initial reports assumed the fifth officer was shot but he appears to have sustained a knee injury. Officers were executing a search warrant in Southeast Houston after a neighbor reported drug dealing including “black tar heroin”. Narcotics officers backed up by patrol officers announced themselves to the suspects and immediately came under fire. Houston Police Chief Art Acevedo says that the ages of the officers injured are: 50, 50, 54, 40, and 33; including two sergeants. The Houston Police Department confirmed that both suspects were killed in the gunfight. UPDATE on our officers: one officer shot in the shoulder has been released. 2 officers in critical condition & 2 others are in good condition. None of them will be released from the hospital tonite. One of the officers sustained a knee injury & isn’t believed to have been shot.